The 9th overall pick by the Dallas Mavericks in the 2017 NBA Draft, Smith Jr. carved out a nice role in his rookie year, averaging 15.2 points and 5.2 assists while shooting 40% from the field, displaying his freakish athleticism on a nightly basis, which explained why he was so highly-touted coming out of college. However, after Dallas swapped their pick for Euroleague star Luka Dončić in this past draft, it seemed as if the North Carolina State product would take a backseat. Indeed, Doncic became an immediate star, becoming the 7th youngest NBA player to score 1,000 points. The trade to New York does wonders for Smith Jr., as he now has the opportunity to showcase his talents for a rebuilding team. 1st-year head coach David Fizdale should give the second year guard plenty of minutes, allowing him to rebuild his confidence and continue to develop in the NBA. An 11-year veteran, Gasol has spent his entire NBA career with the Memphis Grizzlies, a franchise that had made the playoffs every year from the 2010-2011 season until 2017. However, the farthest they ever made it was the Conference Finals, getting swept by the San Antonio Spurs during the 2012-2013 campaign. At the age of 34, the Spanish-born center finally has an opportunity to play on a genuine championship contender, joining forces with the likes of Kawhi Leonard, Kyle Lowry, Pascal Siakam, and Serge Ibaka, rounding out a formidable starting five. Gasol adds another terrific piece for a Raptors team who are going all in on this season, and with Gasol’s $25.6 million player option for 2019-2020, will continue to be competitive throughout the waning years of the big man’s career. The Los Angeles Clippers stand out as one of the biggest winners of this year’s trade deadline, continuing to sell off their expiring contracts. A franchise that continues to max out its opportunities for this upcoming summer, the Clippers not only have a ton of cap space, but have a plethora of valuable assets that can serve as pieces for the future or trade chips in a potential Anthony Davis blockbuster. Picks seem to be the most valuable asset for New Orleans, as they asked for 4 first-rounders from the Lakers during the week leading up to the deadline. In exchange for Tobias Harris, Los Angeles received Landry Shamet, a promising young rookie who is shooting 40% from three, and two first round picks, one including that of the Miami Heat, considered one of the most significant picks that was out on the market. Along with Shai-Gilgeous Alexander and Ivica Zubac, the Clippers have put themselves in an excellent position to do anything they want in free agency, creating a nice young nucleus to combine with potential free agents such as Kawhi Leonard and Kevin Durant. The #1 overall pick in the 2017 NBA Draft, Fultz has battled injuries, personal demons, and shot discomfort, preventing him from developing into the star that his ability allows him to become. 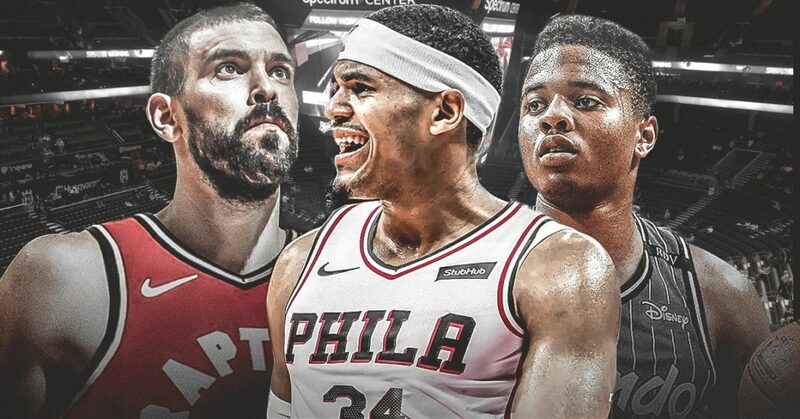 The Philadelphia 76ers have seemingly gone all in on this season, trading for Jimmy Butler earlier in the season and acquiring Tobias Harris from the Los Angeles Clippers right before the NBA trade deadline. Not wanting to wait on Fultz to recover from Thoracic Outlet Syndrome, which could possibly hold him out for the remainder of the season, Philadelphia packaged him off to Orlando. Not only does the trade give the 20-year-old a fresh start, he is going to a team in the Orlando Magic who have built a promising young nucleus with Mo Bamba, Jonathan Isaac, and Aaron Gordon. Also, Orlando is in desperate need of a point guard, and Fultz fits the bill perfectly. In the days and weeks leading up the NBA trade deadline, the Los Angeles Lakers were at the forefront of the drama, after superstar Anthony Davis requested a trade from the New Orleans Pelicans. New Orleans could offer Davis the 5-year, $240 million supermax extension this upcoming summer, but he said that he would not sign the deal and preferred to be traded. After proposing all of their young talent in an attempt to acquire the generational talent failed, the Lakers team chemistry is in shambles, as Lonzo Ball, Kyle Kuzma, and Brandon Ingram do not feel as if they have a future with the team and only serve as placeholders in Lebron James’ master plan. Head Coach Luke Walton has clearly lost control of his team and has no way of calming the situation, only leading to further internal chaos within the organization. The biggest losers from this trade deadline, Los Angeles needs to figure out a way to rebound sooner rather than later. The Memphis Grizzlies had two “stars” on the roster entering the trade deadline, and left with one at the end, trading 34-year-old center Marc Gasol to the Toronto Raptors. However, a franchise that needs to enter a rebuild still has Mike Conley, a 31-year-old, injury-prone point guard who continues to produce while healthy and is signed through the 2020-2021 season. The issue with having Conley on the roster is that he will help Memphis win enough games that will prevent them from landing a top-tier prospect in this upcoming draft. They already have an extremely promising rookie in Jaren Jackson Jr., but are too mediocre to surround him with another star. Keeping Mike Conley forces the Grizzlies to remain somewhat competitive, not good enough to make the playoffs, but not terrible enough to draft a game-changing talent.